Somerset cider producer Thatchers has produced its first apple gin – Thatchers Orchard Cut. Crafted with cider from Thatchers’ Katy apples, the gin is distilled by the English Spirit Distillery, using a selection of botanicals, as well as fresh apple for characteristic flavour. Botanicals including juniper, local Somerset lavender, coriander, macadamia nut, buttercup, Seville orange, lemon and lime have been chosen to work alongside the apple flavours, providing a balanced drink with floral and fruity notes. The Thatchers Orchard Cut 70cl glass bottle (specifically the Nocturne from Bruni Glass) has a full wrap label, representing the cut in the tree. The label itself is produced from a real wood product called Cherry Wood from Fasson. Ed Hemphill at CookChick Design in Brighton created the concept, brand name and packaging. On the decision to use a real wood product Hemphill says: "We wanted the type to have a simple 'burnt on' feel with a single colour Flexo printed black. The natural texture and grain of the wood provides a lovely tactile contrast to the smooth glass bottle." The cidermaker’s recommended serve is an Orchard Cut and Thatchers Haze cocktail. 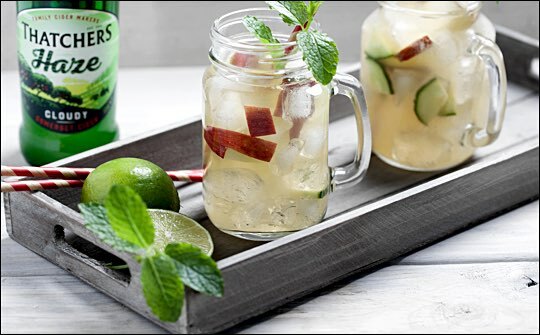 Take 1 part gin and top with Thatchers Haze, decorating with mint, cucumber, and of course a slice of red apple. Thatchers Orchard Cut is 42% vol, and will retail at £33.99. It is currently available at Thatchers Cider shop at Myrtle Farm.